I have to say, in all my years of visiting London, I never traveled or ran much further east than the neighborhoods just past the City. I had run around Whitechapel and Wapping, but that was it. So, after hearing nice things from our readers about Victoria Park and the eastern section of Regents Canal, I decided that it was time to discover a bit of the East End for myself. And I was definitely not disappointed. I was surprised at how nice this part of town was, although few tourists ever go there, really. The 2012 Olympics added a lot of useful development to the East End. This route combines both of those great running trails mentioned above: Victoria Park and Regents Canal, doing some of each. We'll start at Mile End, where three tube lines all meet (Central, District and Hammersmith & City), so it's easy to get to. From Mile End, the route heads north along the canal until reaching Victoria Park, where it then loops clockwise along the perimeter of the park and heads back along the canal again. So, if you're ready to give it a try, here we go! At Mile End Station, go west along Mile End Road for a hundred meters, to the bridge over Regents Canal for the official start of the run. Now turn north and run along the east side of the canal, with the water to your left. 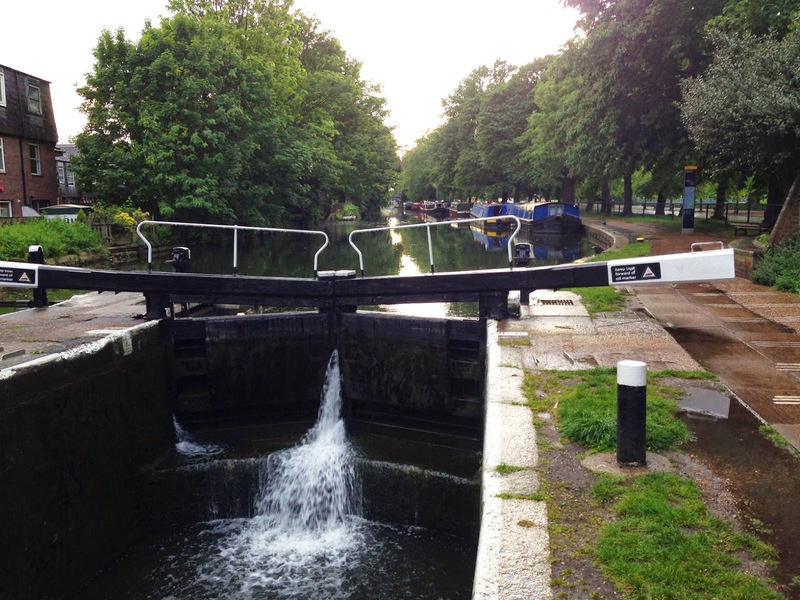 The first iron gate to the steps leading down to the canal is locked, but straight ahead the path merges into the canal tow-path down below, so just keep running straight past the old boat locks. 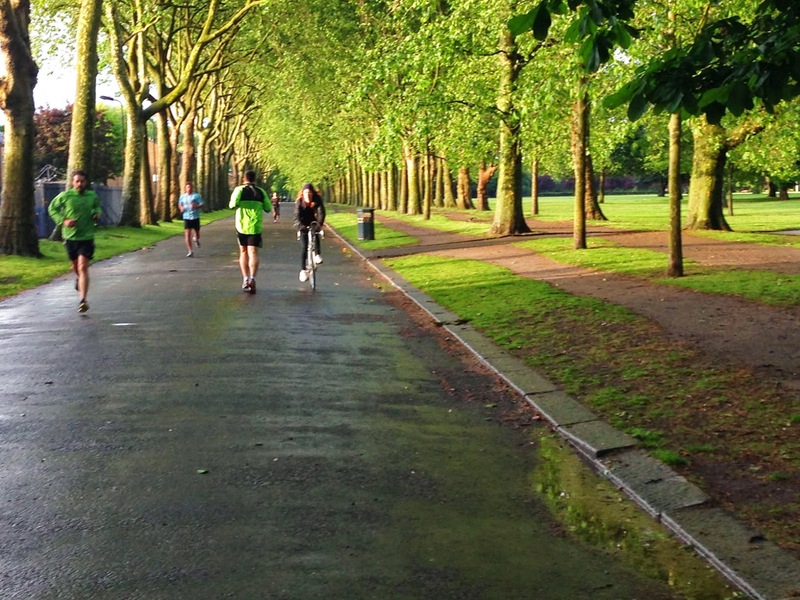 Once you've joined the canal tow-path, it's a straight run to the park. There are quite a few bicyclists on this narrow path, so you have to watch out a bit. 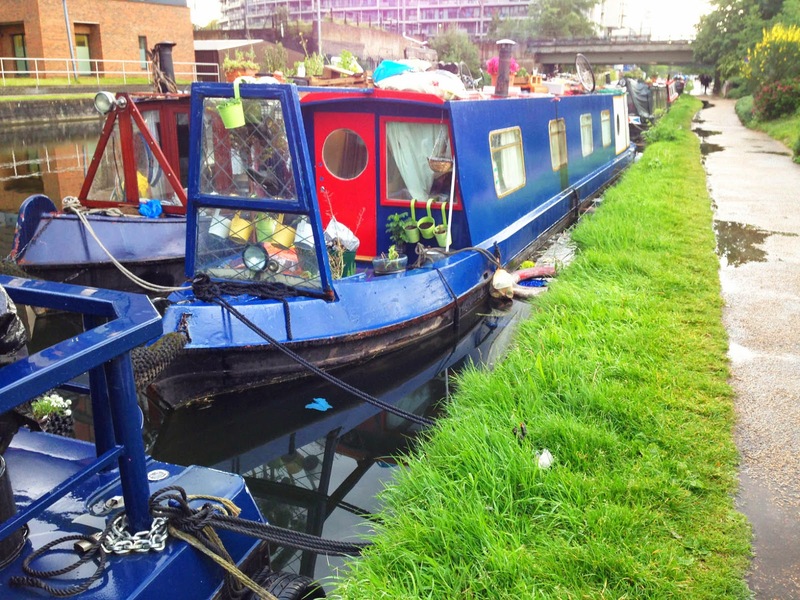 Houseboats along Regents Canal: life is cluttered when you don't have storage space! There are quite a few narrow-boats used as house-boats along this stretch of canal. Along the right side, there is a chain of little parks. They are new, and have ecological and social themes. After 0.75 km, the tow-path rises up over a little side-canal coming in from the right (Hertford Union Canal), and then you'll come another boat lock. Just past the boat lock, at the next row of house-boats, you'll see Victoria Park off to the right. Exit through the gate in the metal fence and run to the street that parallels the canal here, and keep running north. You'll pass a Chinese-looking bridge, and then come to Bonner Gate, where a paved pedestrian street goes into Victoria Park to the right. Turn onto the Night Walk park road and run the short way until you see the gate in the iron fence on the right side, leading into the main part of the park. (This part is a narrow thumb of the park at the southwest corner.) Turn right onto Northern Drive, the asphalt road into the park. Victoria Park is a big, diagonal rectangle, pointed towards the northeast. 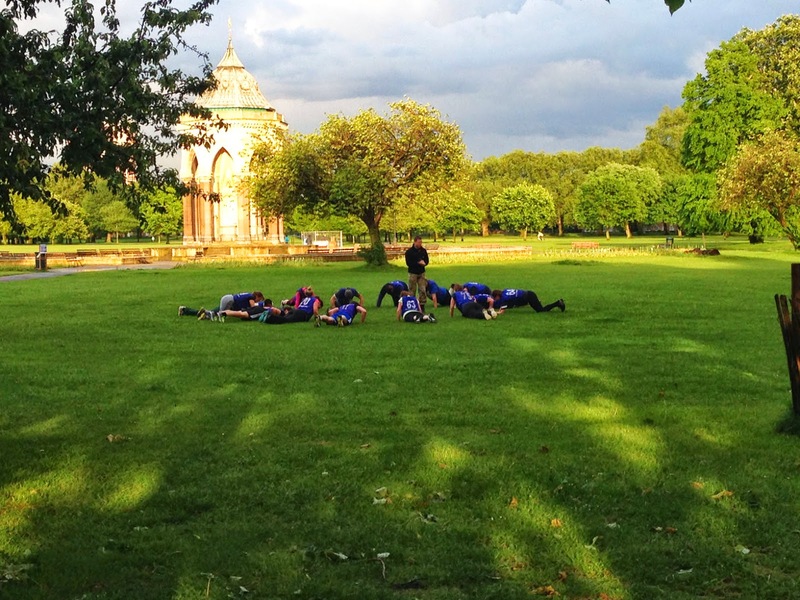 It's full of lawn, trees, monuments and a big playground, and is full of runners and fitness groups. We'll now run around its periphery, going clockwise. The outside fence of the park will be on our left the whole time. 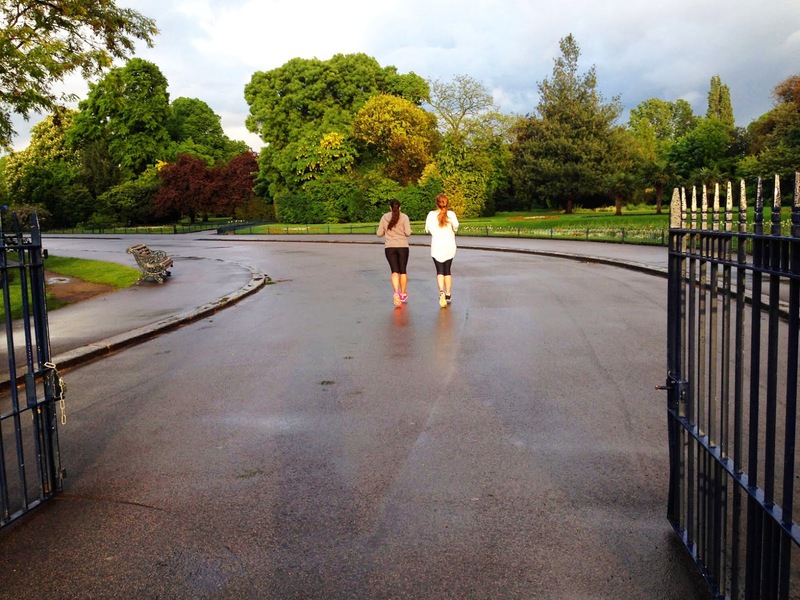 After just 300 meters, you'll come to the only car-street that bisects the park, Grove Road, at the inviting Royal Inn pub. Cross the street (no, no stopping at the pub yet) at the gate and continue northeastwards along the paved road. In the middle of the park, along the right side, you'll pass the Burdett Coutts Fountain and then a lake, the playground, tennis courts, and cricket fields. At the 2.75-km mark, you'll come to the northwest corner of the park, where you turn right to continue running the trail along the eastern periphery. You'll pass two stone alcoves that were once part of the old London Bridge, as the path curves to the right to follow the southeastern side of the park southwards. 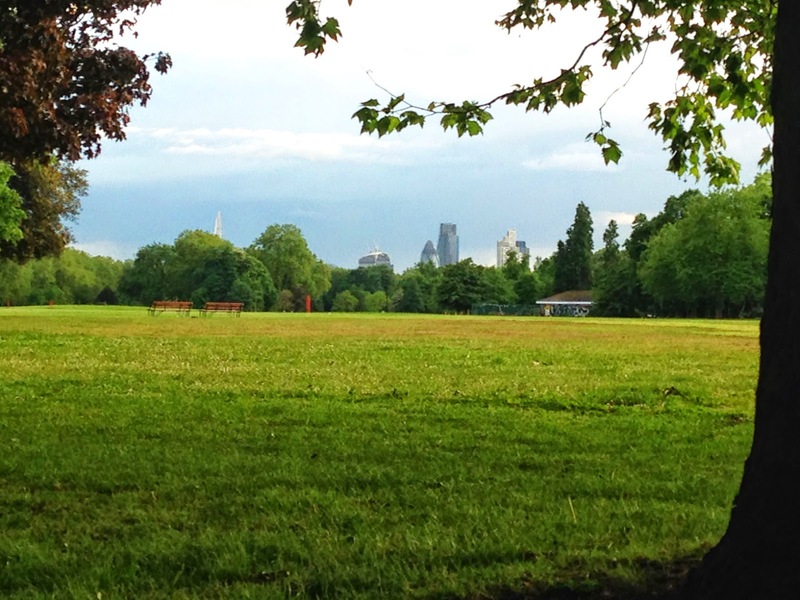 There is also an unexpected view of the City skyline over the lawns. NOTE: If you continued northeastwards, out of the park, you'd soon come to the new Olympic Park, just a few blocks away. 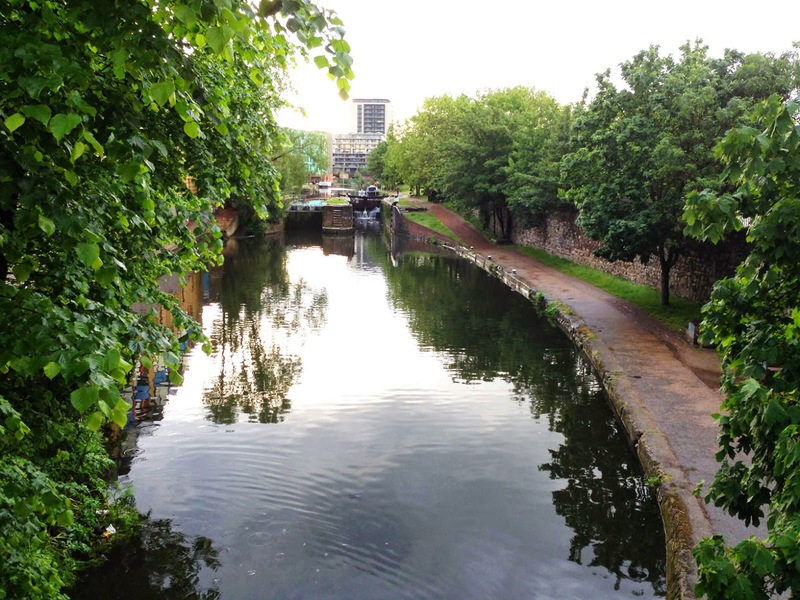 At Gunmakers Gate, halfway along the eastern side of the park, you'll see the small side-canal that ran into Regents Canal before. This little canal lines this side of the park. Now you just keep running south, crossing Grove Road again and then coming to West Lake at the last part of the park. West Lake has rental row-boats, a café, a pagoda and a fountain, making it popular in nice weather. 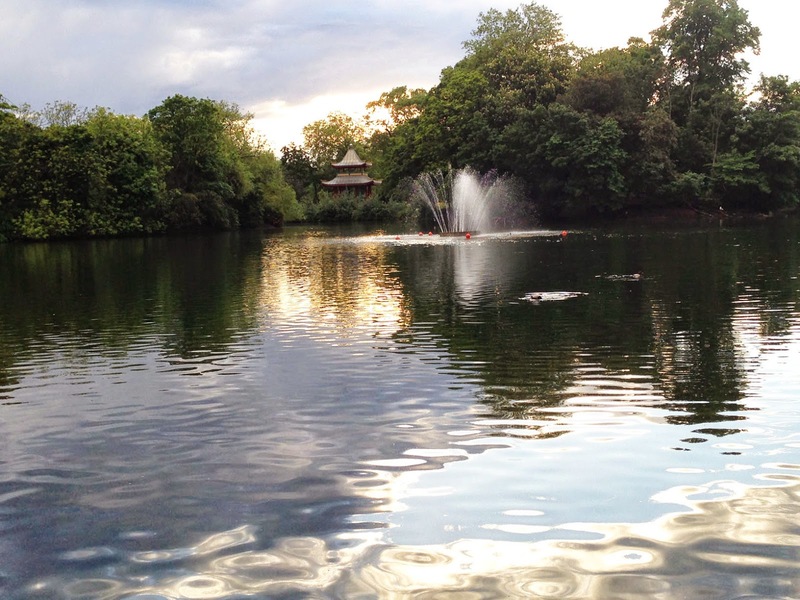 Run past the lake towards the right and you'll find yourself at the spot where you first left Regents Canal to enter the park, near the Chinese Bridge. Run back to the canal tow-path, turn left and run the 1.2-km back to Mile End.